It’s official – Volkswagen Motorsport crowned 2013 WRC World Champions! 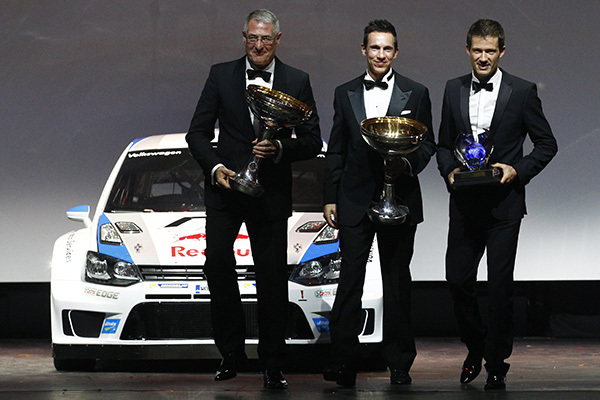 Volkswagen Motorsport, Sébastien Ogier and Julien Ingrassia were officially crowned 2013 WRC World Champions at a gala evening in Paris last week. The official FIA Gala saw the Frenchmen collect their trophies for their dominance in the 2013 championship. The pair clinched the title as far back as October, before the season reached its climax at Rally Wales GB. ‘I look back on an incredible year. If anybody had told us at the beginning of the season that Julien and I would end the season with nine wins and the World Championship title, I probably would have sent them straight to the team doctor. For Julien and me a dream has come true and we are both extremely proud and honoured to finally be able to hold the FIA trophy,’ Ogier remarked after receiving the much-deserved prize. Ogier has also collected the the ‘Caschi d’Oro’ (‘Golden Helmet’) in Bologna, awarded by Italian motoring magazine Autosprint. Volkswagen also received an award for its outstanding achievement in this year’s World Rally Championship. Dr Ulrich Hackenberg, father of the Volkswagen WRC project and member of the Audi AG management board, accepted the prize with Ogier. The Frenchman then flew back to France to continue testing the Polo R WRC in pre-event sessions for the 2014 Monte Carlo Rally, which starts next month. Ogier, together with fellow VW drivers Jari-Matti Latvala and Andreas Mikkelsen has been performing test drives in the French Alps. Ogier, Latvala and Mikkelsen, who will divide up the test work throughout the week, covered 800 kilometres during the first four days of test driving, some of which took place at altitudes of 1500 metres. Volkswagen Motorsport celebrated the perfect end to a perfect World Rally Championship (WRC) season at Wales Rally GB from 14-17 November. The last round of the 2013 series saw Sébastien Ogier and Julien Ingrassia victors once more, their tenth win from 13 rounds. Jari-Matti Latvala and Miikka Anttila followed the Frenchmen on the podium, while the third Polo R WRC crew, Andreas Mikkelsen and Mikko Markkula came in fifth. The three-Polo team achieved the best team result of the season so far, winning 16 of the 22 special stages and claiming 41 of a possible 66 top-three spots. It rounded off a perfect debut season for the German manufacturer, with Ogier and Ingrassia having been crowned World Champions* in the driver and co-driver category at Rally France. Volkswagen Motorsport also won the manufacturers’ title in Spain with help from Latvala and Antitila. 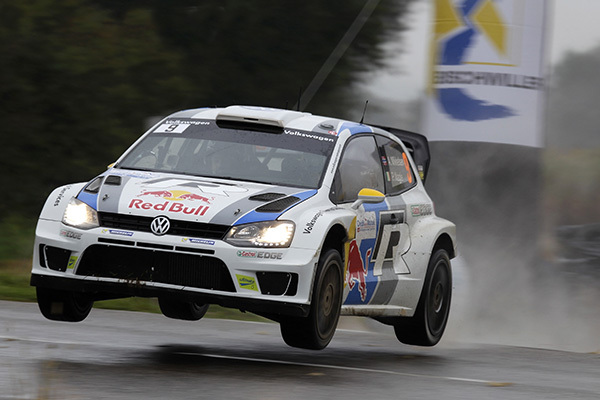 The Rally GB result was Volkswagen’s best since entering the championship at the start of the year. Ogier and Ingrassia came out in top on nine stages, while Latvala and Anttila triumphed five times. Mikkelsen and Markkula meanwhile took two stage wins. Rally GB outs tough demands on both man and machine, and the mechanics were only allowed to service the cars each morning and after the final stage in the evening. Mud, deep water crossings and the notoriously tricky Welsh forests made the stages live up to their fearsome reputation, with 10 of the 22 specials making their return. Only two stages – ‘Chirk Castle’ and ‘Great Orme’ – were held on asphalt. It really was a fairy-tale debut season for Volkswagen Motorsport. The 315bhp four-wheel drive Polo R WRC was in development for a year, and officially unveiled in 2013 trim in December 2012 in Monaco. Volkswagen Motorsport scored victories in Sweden, Mexico, Portugal, Greece, Italy, Finland, Australia, France, Spain and Great Britain – not bad for a team which had only predicted podiums at the start of the season! In Wales, Ogier clocked the fastest qualifying time, with Latvala and Mikkelsen fourth and ninth quickest respectively. After the dark opening stages on Thursday night, Ogier led the event, with Latvala in third place. Mikkelsen and co-driver Markkula were three places further down the field in sixth position. Just as with the 2013 WRC Drivers’ Championship result, it was inevitable that Volkswagen Motorsport would emerge victorious with the Manufacturers’ Championship, too. Leading the manufacturers’ standings since the start of the 2013 season, the stages of the 2013 Rally Spain were the playgrounds at which the German outfit would add the cherry on top of its winning cake. Both titles have now gone to the Polo R WRC squad, in its debut season; quite some achievement. World Champions* Sébastien Ogier and Julien Ingrassia took the spoils in Spain, with team-mates Jari-Matti Latvala and Miikka Anttila in second place, enabling the Wolfsburg car-maker to reign supreme. Ogier and Ingrassia were crowned champions at Rally France, and took their eighth win in Spain. Following a puncture on day two of the event, the French duo started the final day in fourth place, with Latvala in the lead. While the Finn cleaned the roads for his fellow competitors, a reoccurring front differential problem on his Polo R WRC put paid to his dreams of winning the event, as he and Anttila’s performance gradually declined. It wasn’t plain-sailing for Ogier and Ingrassia either, as the clouds of dust on the gravel stages impaired their vision. But, with a determined spirit, the pair posted best times on four of the six special stages. That was enough to hand them a win on the Costa Daurada – Volkswagen only needed seventh place in round twelve of the 2013 series to add the manufacturers’ title to its trophy haul. Polo R WRC #9 was once again the recipient of bad luck. Andreas Mikkelsen and Mikko Markkula were forced to retire early on Saturday after a mistake in the first stage damaged the car’s suspension. The pair returned to the event on Sunday, running under Rally 2 regulations. The Scandinavian pair certainly shone when they came back, though, recording two best times in the third rally Polo. And the car was also the star, as 13 of 15 best stage times and 26 of 45 possible top-three times went to the Wolfsburg wonder. The all-wheel-drive Polo triumphed seven times on the nine asphalt stages and on all six gravel sections. Since the Polo R WRC first took the start at the Rally Monte Carlo back in January, it has racked up 132 of the 215 possible best stage times – 61.4 per cent. ‘Winning all three World Championship titles in one season is simply unbelievable. Given that this is the first season we have competed in the World Rally Championship with the Polo R WRC, it is an even greater achievement. Winning the Drivers’ and Co-Drivers’ World Championship was an absolute highlight for the whole team. It was a dream come true for Sébastien Ogier and Julien Ingrassia in particular at their home event three weeks ago. But the Manufacturers’ World Championship is even more important for a car maker because it proves that it’s not just the driver who is exceptional – the product is too,’ said a proud and very happy Jost Capito, Volkswagen Motorsport Director. The factory team from Wolfsburg has won nine of the twelve rallies to date in the Polo R WRC. Winning three titles in its debut year with the 315bhp Polo is Volkswagen’s greatest motorsport achievement to date. No other manufacturer has managed to win a World Championship title in its first year since the World Rally Championship began. Volkswagen’s performance has truly exceeded all expectations. Originally, it was considered to have set itself ambitious goals by aiming for podium finishes in year one, round wins in the second year and championship titles in its third year. But, with the Polo R WRC in development for a year and a top-pedigree driving team, those goals were always going to be a little on the cautious side. 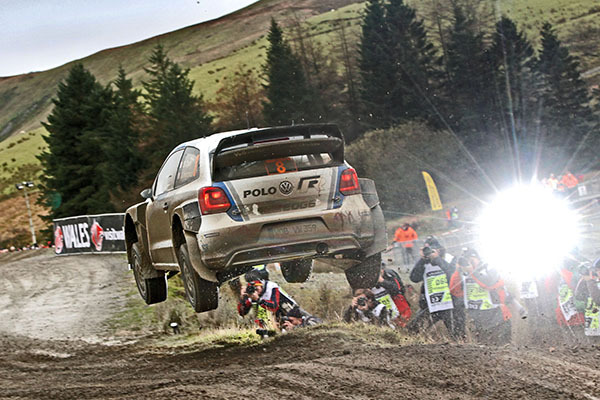 With nothing left to prove, the Volkswagen crews head to the UK next for the final round of the 2103 series, the Wales Rally GB running from 14-17 November. He didn’t have much to do. Volkswagen Motorsport driver Sébastien Ogier missed out on becoming the 2013 World Rally Champion* by one point at Rally Australia. So it was an easy task to score that important mark at the start of Rally France, but Ogier and his co-driver Julien Ingrassia went one better by snatching victory on the last day of the eleventh round of the 2013 WRC in Alsace. Made all the better by being the duo’s home event, Ogier was handed the baton of World Champion from outgoing champ Sébastien Loeb, the reigning master of WRC since 2004. In a bittersweet and disappointing curtain down on his WRC career, Loeb and his co-driver Daniel Elena crashed out during the final day of the event. Volkswagen’s milestone victory in the FIA World Rally Championship (the first team to have won the drivers’ title in its maiden year) was sealed on the first stage of the event, the running of the Power Stage, in which bonus points are awarded to the fastest three cars. Finishing third, Ogier and Ingrassia could no longer be caught by second-placed Thierry Neuville and Nicolas Gilsoul of Ford, so the celebrations began, before the first proper day of Rally France, and with two events of the 2013 season to go. With the drivers’ championship won, Ogier and Ingrassia were given free reign by Volkswagen to go out and win the rally, too. The pair adopted a cautious approach on day one, ending the first 120.63km in fifth place. On day two, though, the pair upped the ante. The Frenchman won five of the seven special stages and were just 1.5 seconds rally leaders and team-mates Jari-Matti Latvala and Miikka Anttila. Going into the final day, two teams from Volkswagen and two from Citroën – including the mighty Loeb and Elena – were separated by just five seconds. Ogier and Ingrassia didn’t put a tyre wrong during the final day, upping the pace yet again, and overtaking Latvala to finish first, with the Finn completing the event on the bottom step of the podium. ‘That is definitely the most amazing rally weekend of my career: first the World Championship title and now victory at my home rally – absolutely fantastic! What an extremely difficult final day. This morning was so incredibly slippery, but my gravel crew did a fantastic job. I obviously feel for Sébastien Loeb, but he was going all out to win, and that sort of thing can happen in such difficult conditions. It could have happened to anyone today. Today is the highlight of our season, and I am overjoyed. I would like to thank my guys. We have done a great job all season. I am very proud of what we have achieved,’ said an ecstatic Ogier. ‘Congratulations to Sébastien Ogier and Julien Ingrassia. They were the best this weekend and fully deserved both their win and the World Championship title. They have proven this season that they are outstanding in all conditions and on all surfaces. I am very happy with third place. We produced a flawless display and were consistently quick. That gives me a lot of confidence for the forthcoming rallies. We achieved our goal of scoring important points in the manufacturers’ championship. 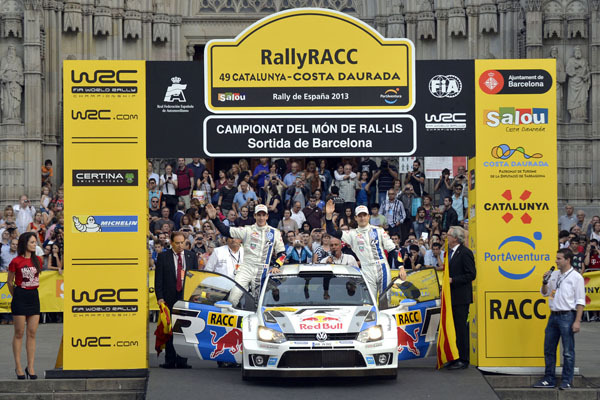 The 2013 title is now within touching distance for the team,’ commented Latvala. The two podium finishes garnered Volkswagen Motorsport 40 points towards the Manufacturers’ Championship, meaning it can now wrap up the title at the next event, Rally Spain on 27 October. Regardless of its opponents’ performance. The German outfit now leads the standings by 80 points thanks to Ogier’s seventh 2013 win and Latvala’s stellar performance in Alsace. Latvala’s brief was simple; to secure as many manufacturers’ championship points as possible. he and Anttila did just that, and led going into the final day of the event, despite torrential overnight rain. There was good news for the third Polo R WRC crew, too, as Andreas Mikkelsen and Paul Nagle finished inside the top 10, in seventh place. Rallying the world with Volkswagen! It was always going to be exciting when Volkswagen announced it was to enter the World Rally Championship, back in 2011. The icing on the cake for us was the choice of car – the thought of seeing a Polo in top-flight motorsport really was something to look forward to. Fast forward to 2013, and the team of three 300bhp+, four-wheel drive Polo R WRCs are leading both the manufacturers’ and drivers’ championships. We dared not think that far ahead when the rallying Polo was revealed, but are genuinely excited by the prospect of Volkswagen driver Sébastien Ogier taking the 2013 crown. If you are equally excited about motorsport and rallying in particular, you can share the excitement with Volkswagen at the ‘Rally the World’ Championship 2013. Head over to Volkswagen’s Rally the World website to take part in a fast-paced interactive game, and experience what it’s like to be a top-class rally driver. Rallying is one of the most thrilling motorsports in the world, and Volkswagen’s latest competition lets you experience the highs and lows as you learn to drift like a pro in the company’s latest sports-orientated models. As the 2013 World Rally Championship heads to Rally France this week, there’s no better time to join the adventure and share the exhilaration with Volkswagen. You could even win a VIP trip as the guest of Volkswagen to Rally Monte Carlo in January 2014. So, enter the contest as a team through the Rally the World Facebook App, and do battle in the special stages. Who knows, you could be tasting the victory champagne!